Installing new siding can significantly boost the curb appeal of your house, improve energy efficiency, and increase your home value. There are numerous materials to consider, each with its unique pros and cons, durability and cost differences. Siding Cost Estimator calculates installation prices for vinyl, wood, or James Hardie siding, (labor and materials). This tool aggregates and analyzes pricing from licensed siding contractors in different regions of the US. This means that when you select your location, you will get a quote for that particular region. Alternatively, if you want to get a general sense of siding installation costs, you can select the National Average setting. To get an accurate price estimate, enter your ground measurements, number of levels, home type, number of doors & windows, old siding removal, house insulation type, and new siding material. For best results, take your time to measure the house properly. Go from corner to corner with a tape measure, and get the Length and Width of your house. If you get sizes like 26' 7", it is best to round it up to 27', otherwise the quote will be less than what contractor will give you. Roof Slope: When measuring / estimating roof slope, you can either use your judgement or use a 2' level + tape measure to get accurate reading. Go into your attic, position the level horizontally, one end against the rafter. Then measure the distance from the opposite end of the level, up to the rafter. Divide this distance by 2. This will be your slope. Example: If your distance is 14", the slope is 7 over 12 or just 7. Follow the provided diagram. Roof Types: If you have a FLAT or HIP roof, select "FLAT" option for Roof Slope. In either case, your house does not have gables, so now siding will be installed above roof base. Gable Side (roof width): Make sure when entering house dimensions that the Gable Side is entered into appropriate field. Your gables will be calculated base on this dimension and roof slope. If you enter wrong measurement into this field, the calculation will be off. Other options: Select number of floors in your home, job complexity (use your judgement, but if you have multiple bump-outs / built in bays, etc, of if your house is Victorian style with all kinds of decorative pieces, use medium or difficult option). Select new insulation type, and number of windows / doors to be wrapped with flat stock aluminum. Removal of old materials: Note that old plastic / vinyl / aluminum siding must always be removed, before new VINYL siding is installed. Vinyl CAN be installed over wood siding. For other materials, you must always remove old siding down to wall flat boards. Asbestos siding: If you have old asbestos shingles on your walls it is best to install new (vinyl) siding on top, without removing asbestos. Otherwise your cost of siding a house will be 3 times more that is estimated by our calculator. Removing asbestos is VERY expensive and can only be done by certified contractors. The whole area should be then concealed to minimize / eliminate asbestos dust. Never let a regular siding contractor remove asbestos shingles. Across the US, the average cost to install siding is $7,500-18,000 for a simple 1,600 sq.ft. ranch home, and depends on the material you use. Vinyl siding is the cheapest, with prices starting at $2.5 per square foot installed. Its followed by aluminum and fiber cement, both of which are in the middle of the price spectrum, between $3.5-6 per square foot installed. 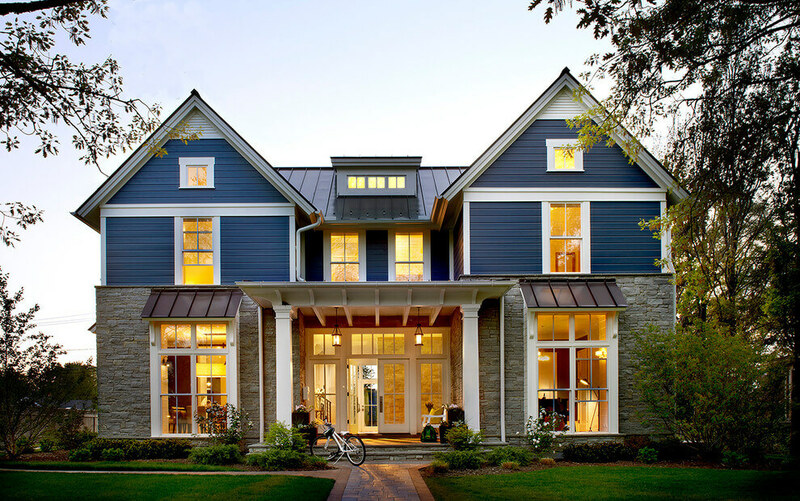 At the highest end are engineered wood, natural wood, stucco, brick and stone siding. Costs for these materials range from $7 to 20+ per square foot. Check out this reference chart to get an idea how much the most popular siding materials cost. Removal of old siding will add anywhere from $1000 - 3000, depending on the amount and type of material being removed. Aside from the cost of siding itself, there are other factors that will impact how much you will end up spending in total. - Your geographic location: labor costs in more expensive cities tend to be 12-18% higher compared to lower income areas. In addition to general curb appeal and cost, its very important to consider how your regional weather conditions will impact the siding's durability. Only the very top siding materials such as real stone and brick can withstand any type of climate. However, other siding materials have their weak spots that become particularly pronounced in particular weather zones. If you home is located in a very mild climate, with low temperature fluctuations, you can safely install pretty much any siding type. IN fact, even cheap siding options will still do ok in this area, and will give you over two decades of service life. The life span of most types of siding such as vinyl, stucco, fiber cement, real and engineered wood can be drastically reduced by prolonged exposure to moisture, strong winds, hail, snow and ice storms, heavy rain, high heat and severe cold, major yearly temperature fluctuations. If your siding is not well suited for your climate, you will also need to spend a lot more money on regular repairs and maintenance. This is why investing more into a siding material that performs well in your location can actually save you a lot of money in the long run. When it comes to popularity, no material can beat vinyl siding. Its installed on the majority of houses across the US, and the reason is obvious - low cost. Prices start at $2 per square foot for labor and materials. Decent quality vinyl siding costs about $4-5.5 per square foot installed. While vinyl used to look really cheap, today siding manufacturers continue to produce truly stunning vinyl siding products. The plastic look is gone, and many people can't tell the difference between high-end vinyl, fiber cement or other composite types of siding. Keep in mind that vinyl siding may not work in all regions. For example, areas that get a lot of rain, high winds, drastic temperature fluctuations may lead to much shorter life span, and other types of damage that will require costly repairs and fast replacement. Mild climates are ideal for vinyl siding installs. Over the years aluminum siding has slowly lost its appeal among homeowners. It used to be the top alternative to high maintenance natural wood siding. However, once budget friendly vinyl siding became main stream, aluminum has been phased out. Still, its worth considering, given that its a low-budget material that can easily last a few decades. On average, aluminum siding costs $3-6 per square foot, including labor and materials. Most homeowners looking for a siding that is a step up from vinyl, go for fiber cement siding. Usually, James Hardie siding is the top choice. In fact, its so popular that most people consider all fiber cement siding as synonymous with Hardie. If you are looking for an alternative to Hardie, Allura fiber cement siding is steadily gaining recognizing and popularity as a high quality material. It costs about the same as Hardie, but has a lot to offer in terms style options. Including labor and installation, average costs for Hardie Plank are around $6.5 - 10 per square foot. There are many beautiful board styles, colors, as well as complimentary accessories and trim options. James Hardie is such a versatile siding that there is really no way to go wrong with it. It will improve the curb appeal of pretty much any architectural home style. Homeowners looking for a siding that looks like natural wood, but without the heavy duty maintenance and high cost, often considered engineered wood siding. Also known as synthetic wood, manufactured wood or SmartSide, this composite siding is made from resins and real wood fibers that are pressed together under very high heat. Engineered wood offers an ideal combination of value, great looks, low maintenance and reasonable longevity. There are plenty of styles, and colors to choose from, as well as custom designs. Many people love the picture perfect look of wood, while others find that it looks unnatural. Still, engineered siding is a great choice for pretty much any style home architecture. Because engineered wood is a fairly new siding product, there are many manufacturers that try to save money of the formulation, producing a cheaper siding, but one that will also fall apart easily. Its best to go for a reputable manufacturer such as LP Smartside or TruWood by Collins. In recent years, LP SmartSide has gained a lot of recognition and popularity. Its currently competing toe to toe with James Hardie. Of you are debating between these two siding manufacturers, check out our in depth guide on LP vs Hardie. Real wood siding offers warmth and charm that cannot be matched by other materials. Even though wood siding requires a lot of maintenance and does not stand up well to inclement weather, many homeowners install it for its aesthetic appeal. Wood siding comes in a wide range of style options: horizontal or vertical planks, stylish shingles, rugged shakes or logs. It can be stained to maintain the natural wood look or painted any color you like. When it comes to cost, what you pay depends on the wood grade and species. Average prices range from $7 to 10 per square foot for common woods like oak or redwood. However, exotic woods can easily cost $15-25 per square foot. In terms of ROI, wood siding is not the best investment, because its so easily susceptible to damage and requires a lot of care. 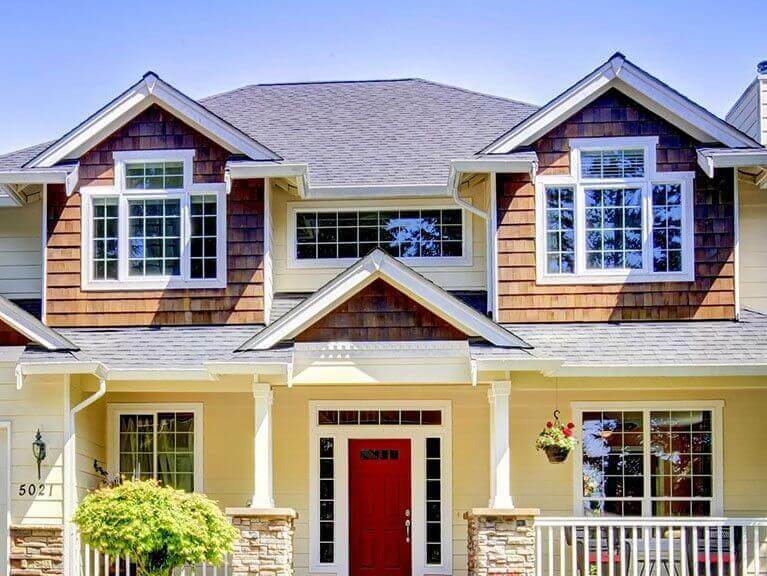 Most homeowners today prefer to buy a home with a siding that is easier to maintain than wood. If you have a high-end modern or southwestern style home, stucco may be the ideal siding choice. It offers timeless aesthetic appeal that has been in style across the globe for hundreds of years. This time tested material is also one of the longest lasting siding materials. When properly installed, stucco can easily grace your home for over 50 years. In terms of cost, stucco can be a rather expensive investment. A large portion of the cost goes to expert installation. Typical stucco prices range from $7 to $10 including materials and labor. However, stucco can be a lot more expensive if you are looking to do any custom work, or want a custom color. Stucco works best in sunny and relatively dry climates. It does not do well in extreme cold or heat, areas prone to heavy rains, snow storms, intense humidity, or earthquakes. Brick siding has been used to clad the exterior of homes for hundreds of years. When installed correctly, its a "forever siding" that protects your home in any weather, does not require much maintenance and lasts well over a century. In addition to superior durability and longevity, brick offers a classic and upscale aesthetic. Most high - end homes are clad either entirely or partially with brick. Today, homeowners can choose to install either full brick or brick veneer (face brick) which is a lot lighter weight, but still has most of the same features. Both types of brick carry a very high ROI, and buyers are willing to pay top dollar for a brick home. The high cost of brick is the main deterrent for most people, who would otherwise love to install this siding. 1,000 solid bricks cost around $500-800, depending on the quality, color and texture of the brick. Together with labor you would be spending $6-11 per square foot. Installing brick veneer is even more expensive: at least $10.5-14 per square foot, including labor and materials. Similar to roofing, siding installation is one of those projects that is best left for the pros. While its possible to install vinyl plank siding by yourself, hire a handy man or a cheap unlicensed contractor, you always run the risk of a hack job. When it comes to expensive siding, such as wood, stucco, or stone, its definitely necessary to work with someone who specializes in this specific material. There are too many intricacies and technical details to the installation which a general siding contractor simply would not be familiar with. Moreover, most siding manufacturers will not uphold their material warranty if the installation was not performed by a licensed pro. This is another important reason to only work with a professional contractor. When getting siding quotes, be sure to ask for at least three references of most recent completed siding installs in the area. It would also be a smart idea to actually visit those homes and see if you like the way the house looks. While this may seem like a little too much effort, its actually time well spent, considering that you are planning to spend thousands of dollars on this project. Once you find a pro you think you can trust, request a detailed contract that includes the entire scope of work, all the materials and accessories that will be used, project completion time line, etc. Many homeowners run into problems with contractors that draw up a very general contract and then keep coming up with "unexpected expenses" that materialize out of nowhere. Installing siding can be a very expensive project, especially if you are considering higher end materials, such as James Hardie, or natural wood. Its important to consider the overall value of your home as well as how long you plan to live in it, to determine if you will get a high ROI, when installing a particular type of siding. According to the National Association Of Realtors, exterior renovations, such as new siding bring some of the best returns on investment, compared to other projects. According to research, you can recoup about 80-83% of vinyl siding cost, at resale. Since vinyl siding products have significantly improved both in aesthetic appeal and durability over the last decade, vinyl is no longer perceived as the "poor man's" siding material. Quality vinyl siding is a great fit for most moderate to average priced homes under $600,000. For premium fiber cement siding, such as Hardie Plank, the returns are 80-85% In general, prospective buyers perceive Hardie siding to be more upscale and durable than vinyl, and are willing to pay more for it. Wood siding offers overall lower returns, of about 70-75% Keep in mind that its also more expensive compared to other types of siding. This means that if you are considering siding replacement as a way to boost your home's curb appeal, it may not be worth it to invest in natural wood materials. To give you more specific data, if your new siding costs $12,000, it will add around $9,600-9,800 to the resale value of your house. Depending on your location, some siding materials may be perceived as more desirable and valuable than others. Its best to consult with your realtor to determine which siding will deliver the best return on investment at resale. Is the cost estimate provided for materials only or for qualified labor and materials? That is unclear to me. Hello, how can I tell which states are in which region? It may seem intuitive, however I’ve been reading Energy Star maps till I’m blue in the face and the South-Central area includes the Carolinas; where do they fall on this site as far as region goes? We’ve added a State to Region map at the bottom of the page. Thanks for pointing this out.